What is the Bidvine Referral Program? Give credits, get credits. The Bidvine Referral Program rewards you for referring your friends and colleagues to Bidvine. Almost anyone that you know who has or works for a small business is perfectly suited to sign up to Bidvine. For every person you refer to Bidvine that creates an account and purchases a credit bundle, we'll give them 10 credits and you 25! Refer as often as you’d like - for example if you help 10 professionals actively use Bidvine and you’ll receive 250 credits! If you refer someone for a high-demand service, you can earn an extra 10 credits each (see details below). How can I share Bidvine to my friend or colleagues? The link we show on the Referrals page is specific to you. 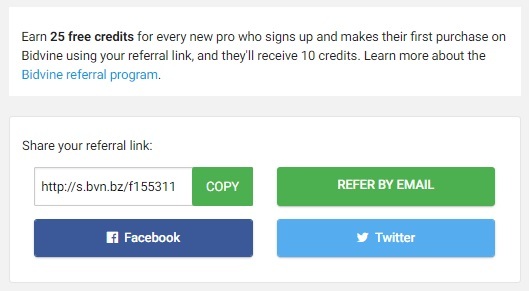 Share it using the email, Facebook, Twitter or Messenger buttons on the Refer a Pro page. You can also paste the link into your favourite app or website to share easily. What do my contacts see? When someone opens your referral link, they’ll see a friendly reminder that you have recommended they join Bidvine. They will then fill out their service, location and profile preferences much like you did when you first joined Bidvine. Your contacts can only use one referral link to sign up. When do I get credits? You and the contact you referred will both receive your credit bonus when your contact purchases credit on Bidvine. You will receive an email at this time notifying you of the amount and who used your referral code. We find that sometimes Bidvine customers request some services more than others. Some of these services are listed as “High-Demand” on the Refer a Pro page. When you refer a contact that signs up and adds at least one of these services to their profile, both you and your contact gets an extra 10 credits: that brings the total up to 35 credits each! Only one such bonus is permitted per referral. Bidvine may suspend or terminate the referral program at any time without notice. The “High Demand” services may change at any time, including any credit bonuses associated with them. Bidvine reserves the right to retract bonus credits in the cases of fraud or violations of our terms of service.